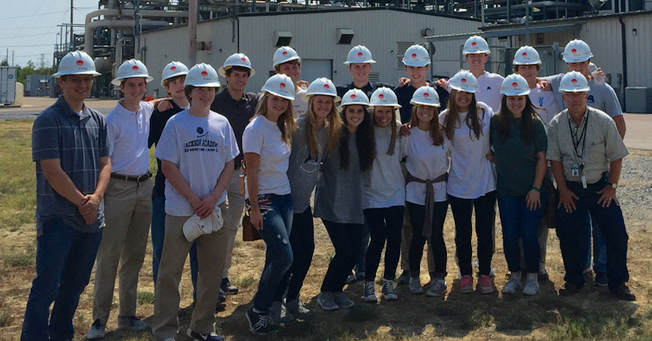 John S. Smith and his Introduction to Engineering class visit an Entergy power plant. The world needs more young engineers. That’s the resounding statement of John S. Smith who is teaching Introduction to Engineering at Jackson Academy. In its second year, the class offers college-level engineering and college credit through an arrangement with Mississippi State University, Jackson State University, and JA. Besides giving students an early start on their college path, Smith hopes the course will kindle student interest in a profession that he says is rewarding, exciting, and needed by society. “I want to create in students an interest in what engineers do,” said Smith. “Most people don’t have a clue of what is really involved in the career, and it is fascinating.” Students are sometimes dissuaded from engineering because of its challenging college curriculum, but individuals quickly experience its benefits after graduation, Smith says. The field offers financial stability early and flexibility as one moves throughout his or her career. Engineers may focus intensely on one area that they love for a lifetime, or they may move through different aspects of engineering as the world and their interests change. Smith also sees many possibilities for individuals who may not have traditionally considered engineering. Companies definitely have a need for engineers with diverse ways of thinking, Smith said. For example, he notes that the field is benefiting from increased interest by female engineers who often bring expertise in relationship building as well as technical knowledge. Even so, there are particular qualities that make a good fit for the engineering career. Attributes include an aptitude for math and science, a curiosity about how things work, a hunger to know, a willingness to ask questions, and a desire to recognize a problem and see it through to a resolution. “We see these attributes in good engineers,” Smith said. Smith has had an impressive career, and he is now happy to share his experience with students who may one day follow in his footsteps. A mechanical engineer by license, he spent time in the Navy followed by a career that took him to nuclear power plants throughout the country, including time in Arkansas, Louisiana, and Mississippi as part of Entergy. The latter part of his career involved working with computers used in nuclear engineering. JA’s class is specifically designed to mirror the college engineering class experience and to be taught by an instructor who meets requirements for teaching on the college level. Also, the class has flexibility to tailor the curriculum to introduce budding engineers to the field. On September 1, students took a field trip to an Entergy biofuels plant to view a solar project. They will visit the Nissan CAVS facility, Mississippi State University, and hear lectures by JSU professors who specialize in electrical and structural engineering. Seniors enrolled in calculus or AP calculus, and who are enrolled in or have taken physics, are given the opportunity to take this class. Introduction to Engineering credit is transferrable to the college of their choice.